Objective: Anastomotic stricture presenting with dysphagia after transhiatal esophagectomy is a common problem. We have reviewed our experience with esophageal dilatations after transhiatal esophagectomies. Methods: We retrospectively reviewed the medical records of all patients who underwent esophageal dilatation after transhiatal esophagectomies. Demographic data, number and methods of dilatations, time between dilatations, and time between surgery and first dilatation were collected. Results: There were 99 dilatations performed on 16 patients by a single surgeon between 3/1/2006 and 9/1/2008 (average of 6.2 dilatations per patient, range 1-19). All dilatations were performed using either the balloon dilator or the Savary-Gilliard bougies (55% and 45% of the time respectively). There were no reported complications. The average time between surgery and first dilatation was 65.3 days (range 22-281 days). The average time between dilatations was 32.8 days (range 6-215 days). 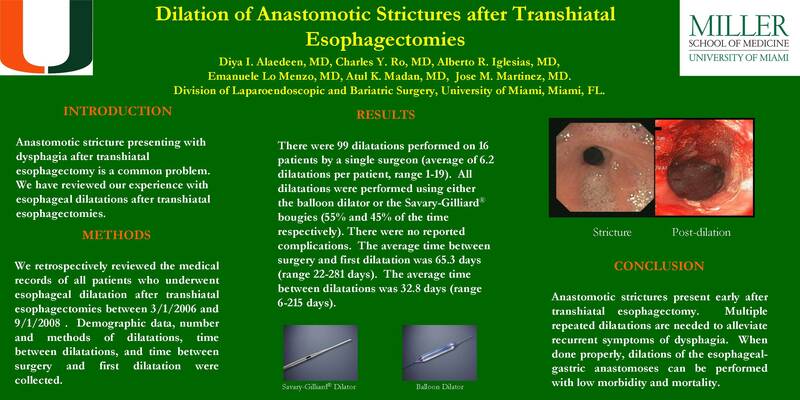 Conclusion: Anastomotic strictures present early after transhiatal esophagectomy. Multiple repeated dilatations are needed to alleviate recurrent symptoms of dysphagia. When done properly, dilations of the esophageal-gastric anastomoses can be performed with low morbidity and mortality.